A premium, organic Apple Cider Vinegar which contains natural Mother and is unlike any apple cider vinegar you have tasted before. The Mackle family have been producing apples in the UK and Ireland for over 50 years, and are proud to deliver the highest quality apple products to their customers. Years of experience and passion have lead them to create a unique Apple Cider Vinegar, Natural Umber, which is raw, organic, unfiltered and contains mother of vinegar. Many people drink Apple Cider Vinegar as it is thought to aid conditions like diabetes, arthritis or high blood pressure. 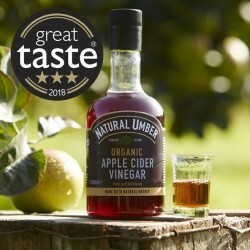 Apple Cider Vinegar is generally unpleasant to taste - but Natural Umber is different as due to the unique fermentation process it retains the natural sweetness of apples and tastes delicious.